Publications such as 'Romance', were written to meet the leisure needs of the 19th Century middle classes. They had some leisure time as well as an amount of disposible income and were looking for forms of escapism. Periodicals which included sensational stories and that involved entertaining characters and exciting plots were very popular. 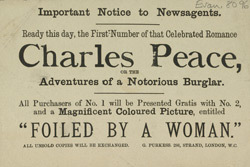 With eye-catching front covers the stories were often based on well known or infamous characters, in this case it is Charles Peace who was an infamous villain, who had been found guilty of murdering his neighbour.